An unusual technique yields crisp yet moist texture. In preparing to interview Standard Baking Co.’s Alison Pray and Matt James a few weeks back, I thumbed through the bakery’s cookbook, “Standard Baking Co. Pastries,” hoping it would prompt an unexpected question. Instead – predictably – it prompted an urge to bake. A recipe for coconut macaroons caught my eye, both because Passover approaches and because it employs an unusual technique. Most recipes call for simply mixing shredded dried coconut with egg whites and sugar. This recipe instead has the baker gently cook that mixture on the stove top before forming the macaroons. The technique yields a version that’s “toasty and crisp on the outside, chewy yet delicate on the inside,” as the cookbook’s co-author Tara Smith writes. Even with the extra step, the cookies are but 10 minutes’ work. 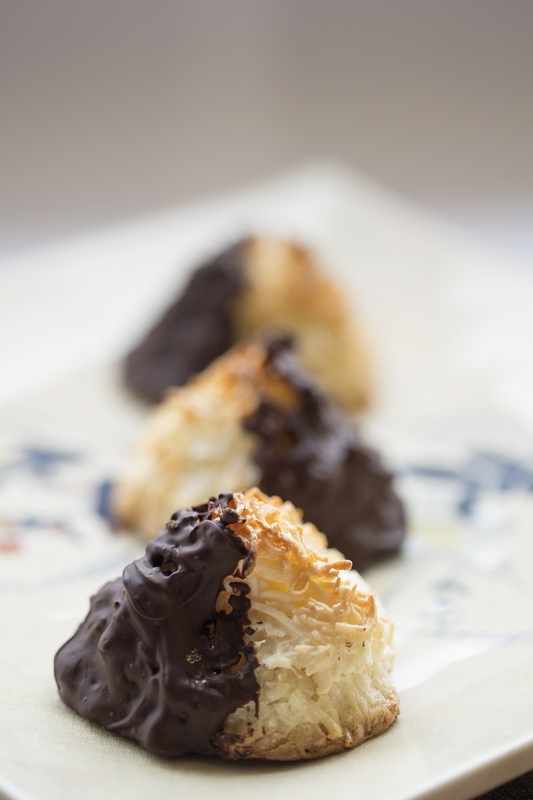 I dipped the macaroons in chocolate after they came out of the oven, but you don’t have to, of course. Also, I formed larger cookies than the recipe called for, so I got fewer and needed to give them a few more minutes in the oven. While the cookies are baking, sometimes the egg whites pool unattractively at the bottom of the cookies; if that happens, simply snip off those bits with scissors. Like all macaroons, these are very sweet. Position oven racks in the upper and lower thirds of the oven and preheat the oven to 375 degrees. Line two baking sheets with parchment paper. In a medium saucepan, combine all the ingredients and cook, stirring continuously, on medium-low heat until a temperature of 130 degrees is reached on a candy thermometer. (This took food editor Peggy Grodinsky about 5 minutes.) The mixture will seem very dry at first, but it will moisten as it cooks. It will become sticky and have a texture like mashed potatoes. Remove the pan from the heat and let the mixture cool slightly. Scoop the batter into rounded tablespoons and drop them onto the prepared baking sheets, evenly spaced. Wet your fingers to prevent sticking, then use your thumb and first two fingers to form each mound into a pyramid shape. Bake for 5 minutes, then rotate baking sheets front to back and top to bottom. Bake an additional 5 to 6 minutes until the edges are browned. Dip half of each cookie in melted bittersweet chocolate if you like (or drizzle on the chocolate); the chocolate will take at least 30 minutes to harden.